According to a study published in the peer-reviewed medical journal The BMJ, exposure to secondhand smoke at four months of age increases the risk of tooth decay in children by the age of three years. There is a high level of dental caries, also called tooth decay or cavities, in deciduous (baby) teeth in developed countries, with a rate of 20.5% in children between the ages of two and five years old in the U.S. and 25% in children three years of age in Japan. 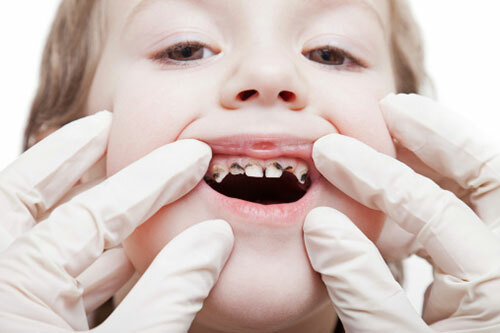 Caries prevention for young children mainly includes sugar restriction, fluoride varnish, and oral fluoride supplementation; however, some studies suggest that secondhand smoke also plays a key role in caries prevalence. Caries can result from various lifestyle, physical, biological, and environmental factors. Causes include inadequate salivary flow, cariogenic bacteria, and poor oral hygiene. One crucial event in oral health is the acquisition of Streptococcus mutans (S. mutans). S. mutans and other bacteria produce acids from sugar that dissolve the hard enamel coating on teeth. Mothers usually transmit the bacteria. The age at which children are at most risk is between 19 and 31 months. Children who are exposed to passive smoking have low salivary IgA levels and higher levels of sialic acid with higher activity. Sialic acid increases the joining of S. mutans, leading to the formation of caries and dental plaques. This suggests that reducing secondhand smoke among children might help prevent caries. So, a team of researchers in Japan investigated smoking during pregnancy and exposure to household smoke in infants at four months of age as possible risk factors for caries in deciduous teeth. They wanted to determine whether maternal smoking during pregnancy and exposing infants to tobacco smoke at four months of age could increase the risk of caries in deciduous teeth. For their study, researchers analyzed data on 76,920 children born between 2004 and 2010 who had routine health checkups at 0 months, four months, nine months, 18 months, and three years of age at healthcare centers in Kobe City, Japan. Mothers completed questionnaires to provide information about their secondhand smoke exposure from pregnancy to three years of age as well as other lifestyle factors, such as oral care and dietary habits. Incidences of caries in deciduous teeth were defined as having at least one decayed, filled, or missing tooth. Qualified dentists made the assessments on all participants. Prevalence of household smoking for children in the study was 55.3%, while 6.8% showed evidence of tobacco exposure. Researchers identified a total of 12,729 cases of dental caries, most of which were decayed teeth. Compared to families with no smokers, exposure to tobacco smoke at four months of age was linked with an approximate twofold increase in the risk of caries. The effect of maternal smoking during pregnancy was not considered statistically vital. Any conclusions about the cause and effect couldn’t be drawn since it was an observational study; as a result, findings may have been influenced by other unmeasured factors. Brazier, Y., “Tooth decay risk doubles in children exposed to secondhand smoke,” Medical News Today web site, October 22, 2015; http://www.medicalnewstoday.com/articles/301299.php. Tanaka, S., et al., “Secondhand smoke and incidence of dental caries in deciduous teeth among children in Japan: population based retrospective cohort study,” The BMJ October 2015, doi: 10.1136/bmj.h5397.